Finally after a long journey of fear and anxiety the two of us decided to get our hair cut. Before getting our hair cuts we went crazy searching around for inspirations as to how we were going to cut out hair. We eventually settled for the straight-cut and middle parted fringe hairstyle. We got our hair trimmed at a Korean Salon @ Hurstville called "Michelle's Hair Story". What a coincidence with my name! The hairdresser cut off around 1-2inch of Brigette's hair but it wasn't short enough so she told him to chop some more (he didn't look happy lol). As for me, I was prepared to cut off a few inches of my hair. The girl hair stylist did a great job cutting and styling my hair. I'm pretty relieved and satisfied. After our new and refreshed look, we dressed up for our anticipated White & Denim Outfit Photo-shoot. The photo shoot wasn't an easy process as we had to manually take the photos ourselves with a tripod and it was also freezing! What can we do, beauty is pain. Guess we had no fear as long as we have each other! and i'm thrilled to discover more bloggers from sydney too! Both of you girls look lovely. I adore your new hair style. I am thinking about doing something with my hair too. Enjoy the rest of your week. 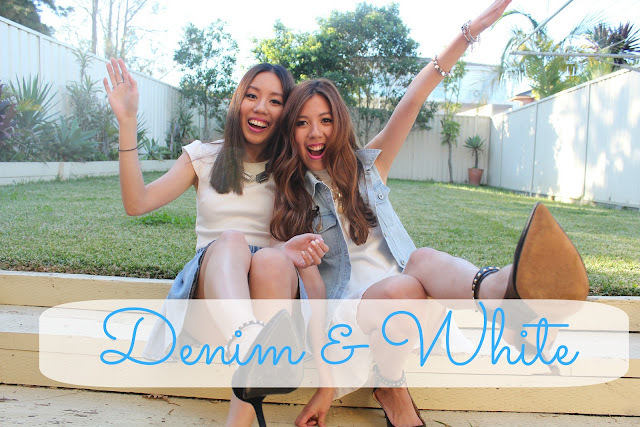 I love how you both each styled denim and white...I think this combo looks totally clean and chic. Gorgeous as usual! I can totally relate to the fear and anxiety associated with getting a new hair cut. But this could not have turned out any better. You both look stunning, gorgeous outfits, beautiful photos. You two are so beautiful!!! the haircuts look great! and I love both of your necklaces. I'm following you two on instagram, I hope you follow me back to keep in contact. both outfits are amazing, simply amazing. you two are both amazing! I'm following you back girls.... keep in touch!!!! Thank you girls for checking my blog. And yeah I'd love to follow each other. I just followed ya via GFC so hope you will do the same. Cute denim styling. Looks great with the crisp white. You two are adorable!!! Love the denim-infused outfits!! That denim skirt is amazing! I love the simplicity, with the denim and silver, looks so nice and crisp. Such a cute blog! You girls are so cute! I enjoyed browsing through your blog. Would you guys like to follow each other? both of you are so pretty and look great in your outfits! and i love your wavy hair, looks so natural. Your outfits are really cute!